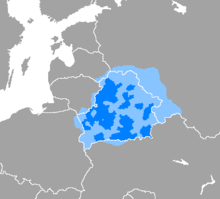 The Belarusian language (Беларуская мова, transliteration: Biełaruskaja mova) is an eastern Slavic language. This language is a part of the Indo-European language family. It is spoken in Belarus and eastern Poland (in the area of Białystok). It is also spoken by Belarusians who live in other countries of Europe, Australia, and North America. When writing Belarusian, people can use the Cyrillic or the Latin alphabet.